Columbus Council Member Jaiza Page, fourth from left. Homeport Senior VP Maude Hill is on far right. Kids ready for lunch handed to them by Elim residents. Seniors at Homeport's Elim Manor community served over 800 meals to area children thanks to the summer lunch program run by Columbus Recreation and Parks Department. Columbus City Council Member Jaiza Page, who chairs the Recreation and Parks Committee, visited Elim on Aug. 2 to salute the seniors for not only serving food but connecting with the kids. Pastoral leaders of neighboring First Church of God, Columbus Ohio also attended. The kids enjoyed lunch as usual during the special program, after washing their hands, and played board games, too. They also received gift certificates and back to school goodies. Council Member Page visited a little over a week after The Columbus Dispatch featured the seniors in an article and video. Page took a tour of Elim Manor with Homeport Senior VP Maude Hill. Bruce Luecke on Ogden Avenue. Homeport President & CEO Bruce Luecke was among the community leaders and elected officials to address residents on Aug. 1 at the National Night Out program organized by South Central Hilltop Block Watch. Bruce spoke to Homeport's commitment to the Hilltop through the homes it has built and the additional law enforcement contracted to patrol and protect. National Night Out celebrates community relationships between residents and law enforcement. 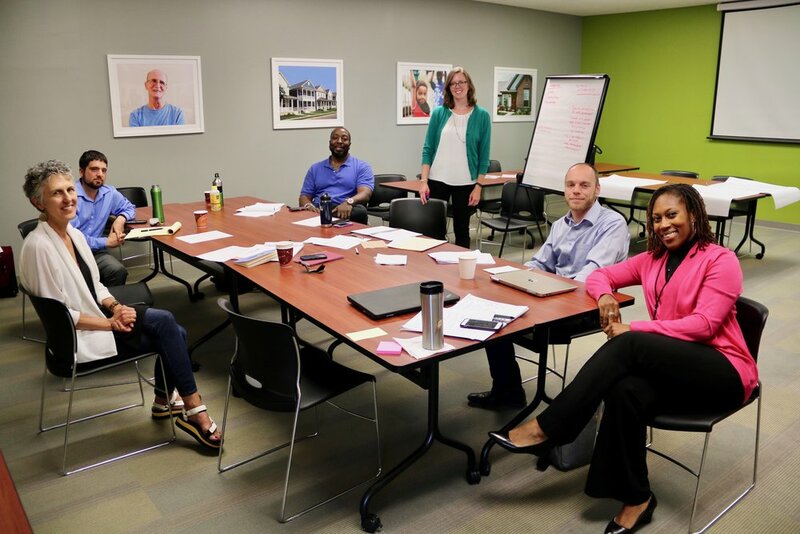 A NeighborWorks America peer exchange group gathered at Homeport headquarters on July 31 and Aug. 1 to examine ways to improve and better finance mixed-income workforce housing. Participants were, left to right, Cindy Visnich Weeks and Steve Laferriere, Mountain Housing Opportunities, Asheville, N.C., Robert Springer, Nuestra Comunidad, Roxbury, MA, Clare Rosenberger, NeighborWorks America, Washington, D.C., Max Benson, Community Frameworks, Spokane, WA, and Leah Evans, Homeport. Non profit managed health care company CareSource delivered on its name when it awarded Homeport with a $7,000 check on Aug. 8. The grant helps Homeport oversee services and programs provided to its residents. Left to right in photo is Homeport President & CEO Bruce Luecke, CareSource Community Education Representative Candice Byers, and Homeport Senior Director for Resource Development Laverne Price. Car seat safety features were shown to residents of Marsh Run by Karisa Harvey, right, of Columbus Public Health. Eight residents of Homeport’s Marsh Run apartments received free car seats from Columbus Public Health on Aug. 16 after taking a one-hour instructional class at their community center. Homeport contacted Columbus Public Health about car seats when it learned several residents faced transportation or cost barriers -- or a combination of the two -- in receiving car seats. The call opened the door to free car seats available through a Buckle Up for Life grant from Toyota and Cincinnati Children’s Hospital. Harvey taught the class at Marsh Run. “The families were great. They were very appreciative. They learned a lot,” she said. On Aug. 9, CCIIR continued its volunteer efforts at American Addition, scraping and re-painting the community center in the subdivision being redeveloped by Homeport. Above, Jason DeStefanis, VP of Business Development at Carrara Companies, carries paint. Behr Paint sales representatives Sean Miller and Zach Stonerock painted, too. Behr Paint's Sean Miller, right, after the paint job at Tray Lee Center. Behr Paint donated the supplies. Columbus Foundation Fellow Caroline Corona completed her 10-week assignment with Homeport but not before she spoke on Aug. 11 at a Columbus Foundation luncheon. 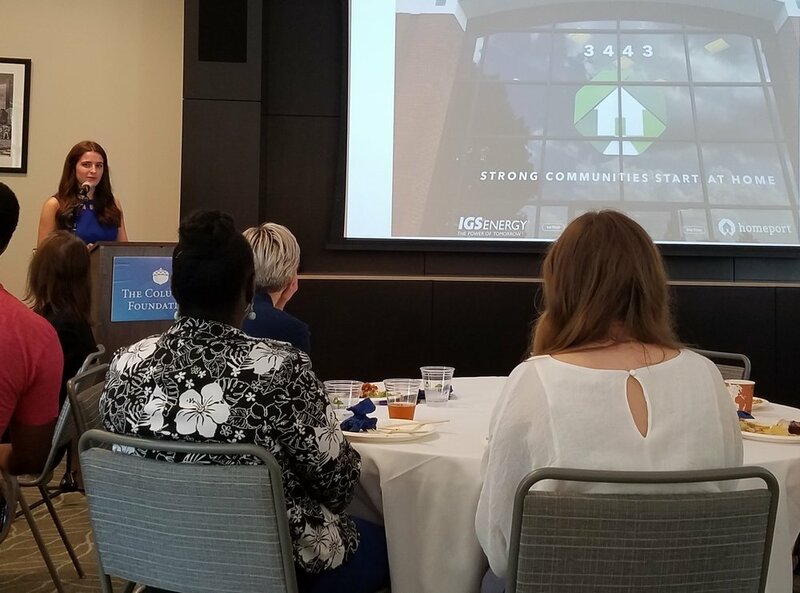 Caroline presented highlights of her experience studying the impact of the Foundation's Gifts of Kindness program on Homeport's eviction prevention efforts. The Mason, OH, resident has returned to The Ohio State University for her junior year where she is a student in Public Affairs and City & Regional Planning. Homeport on Aug. 24 welcomed for the first time work-study program participants from Cristo Rey High School in Columbus. Pictured left to right in the photo above is Chief Administrative Officer Beth Ware and students Hadja Diouf, Myra Wood and Brianna Bollers. After orientation, the students had lunch. 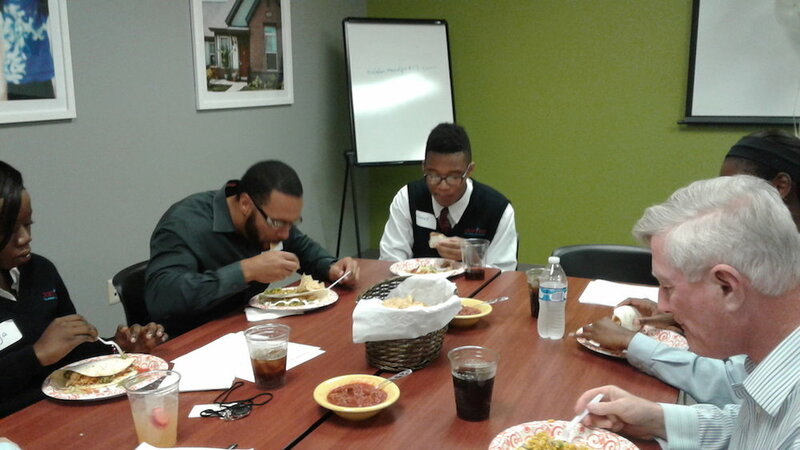 In the second photo, Howard Fairley, a Cristo Rey junior, center, hears, between bites of lunch, from Asset Management's Josh Martin. The students begin working at Homeport after Labor Day.